My name is Daniel M. Lofaro. In 2008 I received my masters and bachelors in Electrical Engineering and Control Systems at Drexel University in Philadelphia, PA. I am a soon to be a graduate of the Ph.D program in the Electrical and Computer Engineering Department at Drexel University. Since the winter of 2006 I have been an active member of the Drexel Autonomous Systems Lab (DASL) working on autonomous aerial and ground vehicles. 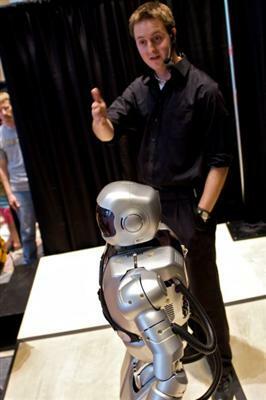 In 2008 I became one of the two lead students on the NSF-PIRE Humanoids grant that allows me to work with the full-size (130 cm) humanoid robot Hubo in which my Ph.D work is focused. I primarily research on end-effector velocity control (throwing) of non-planted robots with my development platform being Hubo. I successfully developed methods that allowed Hubo to throw the inaugural pitch at a Major League Baseball game on April 28th 2012 in front of 45,196 fans. This showed the real-world success of my research. Currently I am working as one of the student leads on the DARPA Robot Challenge Track-A team DRC-Hubo (http://drc-hubo.com/). I work directly with Dmitry Berenson at WPI on the valve opening/closing task of the challenge. In collaboration with Mike Stilman and Neil Dantam at Gerogia Tech I lead the developed of the needed open-source, Linux based, BSD licensed controller for humanoid robots. Our software is currently being used by WPI, MIT, Purdue, Ohio State, Swarthmore College, Georgia Tech, and Drexel University. Collaboration is very important to me. I believe that international collaboration is the key to success in both research and teaching. I have spent expended periods time abroad in multiple countries, both European and Asian. This has resulted in published work in noted journals and conferences with colleagues from Turkey, South Korea, Croatia, Singapore, and Japan. International travel has been a catalyst for this success. Experiences abroad have solidified my belief in the importance of international collaboration and travel. In addition I am a strong believer in outreach, especially in the STEM fields. This includes volunteering and public educational science demonstrations at the Please Touch Museum of Philadelphia, the USA Science and Engineering Festival in Washington DC, FIRST Robotics, Philadelphia Public Libraries, Maker Faire in New York City, and more. Most recently I been recognized for my outreach by the Pennsylvania State Senator LeAnna Washington. Outside of academics I am an avid motorcyclist and amateur photographer. My photographs have been published in multiple magazines, won awards and have been shown in a public gallery. In addition to photography, playing music is one of my primary forms of self expression. I have lead a quartet since 2001, we still perform today where I play the trumpet. I have written one piece for my quartet and many pieces for the piano. In addition I play competitive volley ball and billiards for Philly Slam and the American Pool Association respectively. My entrepreneurial tendencies have brought me to work as a consultant for an Unmanned Aerial Vehicle facility since 2010. Additionally I am working on a startup of my own related to international conferences and networking.